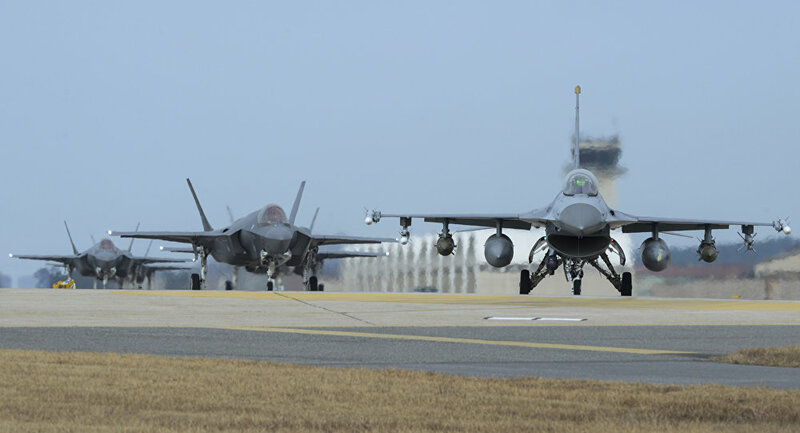 TOKYO (Sputnik) - The first of the F-35A fighters Japan had purchased from the United States has been deployed at the Misawa Air Force Base in the north-east of the island of Honshu, Japanese Defense Minister Itsunori Onodera said at a press conference on Friday. "The deployment of the F-35 fighters with high-performance capabilities is of great importance for ensuring the security of Japan at a time when neighboring countries have been rapidly increasing the capabilities of their military aviation in recent years," he said. Japan has been enhancing its military capabilities since last year, approving the largest budget in the country's history for the next fiscal year (starting from April 1, 2018) in the amount of 97.7 trillion yen ($897 billion). The country's defense spending has increased 1.17 percent year-on-year to 5.19 trillion yen ($47.6 billion) due to North Korea's growing activity in the development of its nuclear and missile programs, as well as Tokyo's intention to improve its anti-missile defense. The tensions on the Korean Peninsula have further escalated last year, as Pyongyang continued to pursue its nuclear and missile programs despite the warnings of the international community. As a part of the efforts to appeal to North Korea, the UN Security Council imposed several rounds of sanctions on the country on December 22, 2017, in particular forbidding oil sales to North Korea and the buying textiles from the country. The purchased by Japan F-35A aircraft is the most lightweight and low-cost version of the F-35 fighter jet. During the next financial year, which will begin on April 1, 2018, the government of Japan plans to deploy another nine such fighters.